All those have in common that they work with a toggle lever. So I started to sketch how my tool should look like, also looking at what stock material i had around. The first part to be machined was the main tool body which is also the most complex one. I startet with machinig the silhouette and milling flat the surface that was left from sawing off the piece of steel form the bar. Did I ever mention that I really love deburring mills? I bought one quite a while ago and since then am using it more and more. The material on the Inside of the gooseneck was removed; on the picture you can see me finishing using a finishing carbide-endmill which provides very nice surface finish! I then started with the squeezing lever head which is going to be one link of the toggle mechanism. The two other parts - the ram and the ram axle are made from hard chrome plated bar (Pretty easy to machine when you get through the hard chrome layer - it produces a very abrasive dust though!). That should work pretty good together with mild steel. Since the load of the connection betwen axle and ram is only pressure, the connection (a stub with an M4 thread) just needs to keep the axle in position. Well - thats it for tonight - I have to go sleeping and get up early tomorrow. Excellent - looking forward to the rest of the writeup, my next project is going to need a lot of rivets, and this looks like a great way to install them. Thanks! Its a beautiful tool Florian and one that will come in very handy I am sure for those hard to reach rivets!! Following along with interest here. Hello - I am back with the second part! Crueby, the riveting tool is extremely handy, especially if you have to squeeze lots of rivets! It takes less than a second to squeeze one. It definitely takes you longer to drill the hole than to squeeze it. Even inserting the rivet into its hole does take more time! But when I made an assembly test after reaming the two bores, I had to find out that the levers were too long. Damn! Well - I din't feel like going through the whole machining the outside dimensions-process and I just grapped a piece of 12x4mm brass flat bar to make the correct levers. The End of the levers was machined into a polygon with many edges and then rounded off with a file. To produce the bolts and axles for the connecting levers, I took two pieces of high grade steel and first turned them into the required diameters. Then I switched over to the milling machine and machined the hexagonal heads of the bolts. After that, I went back to the lathe, parted them off, machined the head to the required length and finally chamfered the heads. I forgot to take pictures when I was making the rivet head forming dies. I used a center drill to create a small center (not too deep!) to guide the ball mill I used after that. And the rest is just heat threading (harding and tempering) and finally polishing the forming cavity. Brb with some application pictures! Very nice! I have to make one of these. I had looked at getting a table-top arbor press, but this looks easier to get into tight spaces on a model. On my Shay, I had done the rivets with a backing bar and a handheld die with a hammer, but it was difficult to get consistant results, this looks like a better approach. I have some thick bar stock that should be adequate for the main body. My next engine (a Lombard Hauler) has a lot of rivets around the smokebox, firebox shell, and the saddle tank over the boiler. It will need about a 3-1/2" reach, which should be no problem as long as I make the upper body of the tool thick enough. It looks like the lower forming die slips into a hole in the moving rod, and the upper die is threaded into the top of the body. So, for different diameter rivets, those two parts could be changed out for a different set, correct? One other question, how much longer than the thickness of the material did you cut the rivets? That is probably a trial-and-error thing depending on the size? Okay, one more: did you need to anneal the rivets first? 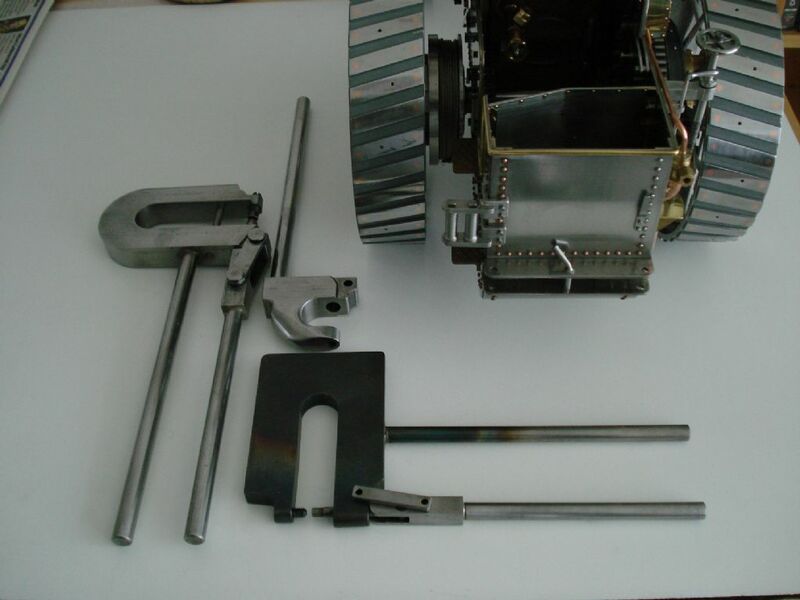 You are right, the head forming dies are screwed into the main body and the ram and can be exchanged for another head diameter. I dont think it is a Problem if you build one with 3-1/2'' reach but you will need to increase the cross section dimensions at the curve of the gooseneck. To give you an idea: I am working with 1mm rivets and the cross section is 20x20mm. And I can already feel the tool flex a bit. To form a complete head, the rivet should stick out in about 1.8 to 2 times the rivet shaft diameter. But if you dont need the head to be completely formed on both sides, it is already enough if you have the rivet sticking out as much as its diameter. You then only get an incomplete head but it will be strong enough. (That is what I did on my cochran smokebox. First you insert the rivets into their holes. I have a similar riveting tool I made years ago. It came with three different sized castings for the U shaped bracket. I just finished making one of these tools, using your photos/drawings as a guide, and it works AMAZINGLY well! I tested it using some 1/16" shank brass rivets (from RivetsOnline.com) that I had left from earlier projects, riveting together a pair of steel bars. Line it up, one quick squeeze on the handles, and it makes a perfect rivet. MUCH quicker and more consistant than peening it over with a hammer. Another thing I noticed was that the head it forms (at least how I have the tip shaped now) is a little smaller diameter than the one that came on the end of the rivet, which actually works out well - depending what size head I want to have showing on the outside, just turn the tool around and it can do large or small. This is going to the very useful on the boiler shell and water tank on my Lombard Hauler build (it will not be holding pressure alone on the boiler, those joints will be silver soldered). Here is a picture of my version, I had a length of 5/8" thick x 2" wide steel bar that I made the head out of, made it long enough for the longest reach this project will need, which is 3-1/2". Hey - that went quick! Its nice to see your version of it! I am looking forward to seeing your riveting work on the Lombard hauler! The size of the head depends on either the length of the shaft that sticks out, on the thickness-adjustment you made with the upper former screw and as you mentioned also the former itself does influence the rivet head size. You're welcome and i'm happy to see other people building rivet squeezers too because I showed it! At least in my opinion, real rivets will always look better than imitated ones. And i like it if someone decides to use real rivets beaucse its relatively easy to rivet them with these squeezers.